The Undercover Boss TV series broadcasted for the first time in Britain in 2009 poses useful questions for every leader: what would you hear about your organization if you went undercover among your employees? What would you learn about the work and workers? What would they be saying about you – and would it surprise you? The TV series has been shown in at least six countries. The undercover boss’s surprise at how dedicated and talented employees are is one of the running themes of the show. How would it be for you: do you know who you are leading? Professor Julian Birkinshaw recites The Undercover Boss example to leaders to remind them that a title or role does not mean you are all-seeing. “It is important to understand what the work you lead is really like: to get close to the everyday life of employees and the customer experience, see it in practice.” Understanding employees is particularly important when changes are needed in the organization. “The boss needs to understand what drives and motivates people in their work, and what the company’s story is from the employees’ perspective. This allows the leader to communicate changes correctly, minimizing misunderstandings.” Julian Birkinshaw sums up this goal for leaders as: “Understand your people”. Naturally, going undercover is not the only way to get close to employees. The professor reminds about the management by walking around method and reverse mentoring. Meetings should be arranged beyond the same tier to include people from different hierarchical levels. A lot can be learned in the smoking area or around the lunch table when you are there to listen rather than take over. “Leaders need to see the world through their subordinates and understand the contexts and limitations for work.” Working undercover alongside others means leaders see subordinates as well as themselves in the mirror. “Do you know your employees’ nickname for you?” Birkinshaw asks. 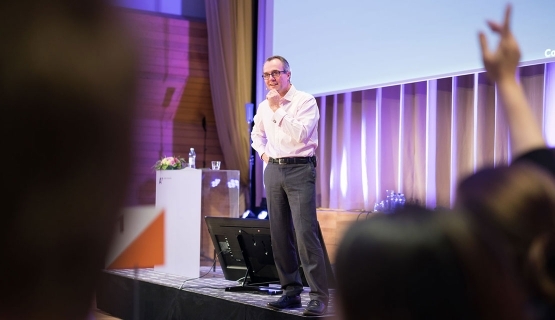 Professor Julian Birkinshaw from London Business School was lecturing at Aalto Executive Summit 2018 in Helsinki. He was talking about adhocracy and how leaders need to liberate their team to act instead of following rules. Read more about Aalto Executive Summit and degree programs.